Fleeing their homes and journeying across the world, refugee claimants arrive in Canada in search of safety, community, and a new life. By joining the Kinbrace Companion Circle, you provide the stability and strength refugee claimants need to turn exile into opportunity. *To set up your monthly gift, click the box: Repeat this gift at the end of every month. Join the Kinbrace Companion Circle to provide welcome, safety, and a future full of hope to people who have been exiled from their home countries. Make a difference every month with an easy and secure recurring donation on your credit card or through your bank account directly. You can also update your donation at anytime. Get special updates, insider information, and a dedicated point person to answer any questions to see and know how you and your donation are helping. 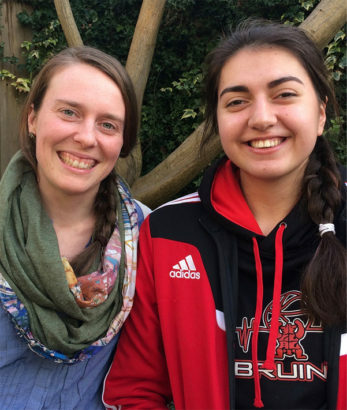 Malena (right) – artist and star basketball player – with Emily Parsons Dickau, Community Building Coordinator. When Malena and her family first arrived in Canada as refugee claimants, they didn’t know where to go for help or what to do next. They were relieved they were now in a country that promised safety from persecution, but this new country also came with new customs, processes and paperwork that were confusing. They felt scared, overwhelmed and alone, not knowing what was going to happen next. Then someone told Malena about Kinbrace. “We had no idea what Kinbrace was. We just thought they might help us find a place to live and that’s it. But when we came, people were so much nicer than we expected. Thanks to the support of Kinbrace Companion Circle donors, Malena’s family has so much more than a place to live. Malena and her family have a safe place to belong and a community that cares. Welcome to the Kinbrace Companion Circle monthly giving community. Your open heart and generous hospitality builds community with refugee claimants from around the world. Kinbrace is a charitable organization that welcomes refugee claimants with housing, education, and support. By extending hospitality and creating community, we build vibrant, long term relationships that help the world’s exiled people create a new home here in Canada. Donations will help provide housing, orientation, accompaniment, and education and make an annual impact by supporting refugee claimants and their families. You can find more information here. Kinbrace operates with strict financial guidelines and operating procedures overseen by our Board of Directors. Financial statements are audited annually and posted online (click here to view). For any questions, please email us at info@kinbrace.ca or call us at (604)-255-9691 and we will be happy to answer your questions further. Please make your cheque payable to Kinbrace Community Society. You can set up a monthly Pre-Authorized donation by filling out the Pre-Authorized Bank Withdrawal Form and sending it into our office.